This is a collaboration between two of India’s finest sons of the culinary arts. If you have not heard of Sanjeev Kapoor (Sanjeev is probably the most celebrated of Indian chefs, presenting Khana Khazana on India’s Zee TV) then you must have been living under a rock with no access either to cookbooks or the internet, for surely you would have read my previous reviews of his work! Chef Harpal Singh Sokhi is an expert on Hyderabadi cuisine, and Sanjeev’s respected friend and colleague. But what is Hyderabadi cooking? It will be a mystery to most Westerners, who are very unlikely to have encountered it, and it is revered by Indians, who might also have trouble tracking down authentic dishes. It’s truly courtly, special and grand but at least this volume makes those dishes more accessible to the home cook… and what home cooking that would be! Royal Hyderabadi Cooking is an elegantly presented volume with stylish photography by Bharat Bhirangi illustrating every recipe. The book has a modern feel with the food being the rich focus in a minimalist setting. Although the ingredients look a lengthy list for some dishes, it’s mostly spices that are commonly found in the domestic larder. Apart from being a striking cookbook, Royal Hyderabadi Cooking is also something of an archive for a style of food preparation that is disappearing. The authors have been lucky enough to recruit the indispensible aid of two national culinary treasures who have lifetimes of expertise. Begum Mumtaz Khan is considered a living legend and is a member of the Jagirdhar families of the last Nizam, and has actually tasted the food from the Royal kitchens. She has conducted cooking classes and hosted Hyderabadi food festivals. Ustad Habib Pasha has a passion for Hyderabadi food and a wealth of experience. He has worked in Hyderabad’s most famous restaurants and has been generous to our authors with his knowledge, revealing the secrets of aromatic blends of herbs that help to give this cuisine its distinctive flavour. There are so many striking recipes to discover here but I have a few favourites. Murtabuk is a layered stack of chapattis with a filling of minced chicken, eggs and spices and is served in wedges as you would a savoury birthday cake. It was Begum Mumtaz Khan who taught the authors how to cook this to perfection. Thikri Ki Dal is a delicious and comforting dal which contains amongst the spices, onions and ghee… 2 three-inch pieces of earthenware! The thikri are heated till red hot and then plunged into the food. They are removed before serving to avoid damage to either guest or crockery. This method is said to impart a distinctive and earthy flavour. Truly unique. Double Ka Meetha is a sweet and syrupy dessert that would be a fitting end to a Royal Hyderabadi meal. It’s a confection of bread, nuts, cream and saffron and simple to make. I wouldn’t reserve this for just Hyderabadi meals, this would be welcomed anytime by those with a sweet tooth. The title suggests something sumptuous and rich and that is just what this food is all about. 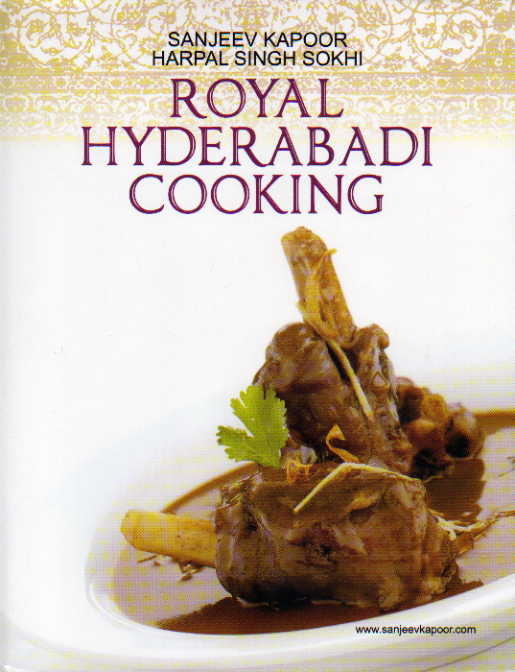 Royal Hyderabadi Cooking presents recipes that are regal and festive but accessible to the home cook. Amazing! See my reviews of other books by Sanjeev Kapoor here.